Cara James, director of the Office of Minority Health at the CMS, runs the agency's program for addressing racial health disparities. 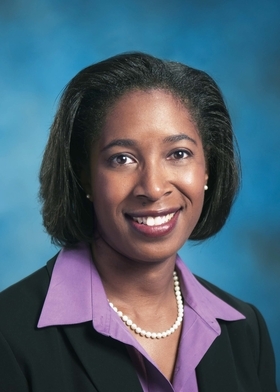 She previously directed the Barbara Jordan Health Policy Scholars Program at the Henry J. Kaiser Family Foundation. Modern Healthcare reporter Steven Ross Johnson recently explored the agency's efforts to address healthcare disparities. The following is an edited excerpt. Modern Healthcare: How has the Office of Minority Health evolved since your arrival four years ago? Cara James: The office has evolved in a number of ways. We've grown our staff. We also have evolved our work portfolio. So we have a couple of signature efforts that we work on. The first that we've been doing is From Coverage to Care, to help those individuals who are getting coverage through the marketplace understand their coverage and connect to healthcare so that they can live a long and healthy life. Another effort is the release of the CMS Equity Plan for improving quality in Medicare. It focuses on six priority areas that our stakeholders told us were really key. And our third effort is improving our CMS data to help understand where we have our gaps and where we can do better. MH: What are some of the biggest barriers to reducing healthcare disparities? James: From a CMS perspective, one of our challenges is just really trying to touch as many places as we can. If you think about Medicare, Medicaid, marketplace, individuals on dialysis, nursing homes, home health, there are a number of areas where we still see quite large disparities. It's a challenge just trying to be at so many tables. Even though we have improvements in health coverage, we still have a number of people who don't have access. Coverage doesn't always equal access. So ensuring that the healthcare system is able to meet the needs of populations that vary from one geographic location to the next or from one community to the next is a challenge that we continue to face. MH: What are some of the strategies? James: It's very simply a USA framework. We're trying to increase understanding and awareness of health disparities. That's the “U.” Our “S” is to develop and disseminate solutions. And the “A” is to implement sustainable actions through ourselves and our stakeholders. We developed From Coverage to Care for those individuals who are coming into the healthcare system, some for the first time ever, some for the first time in a long time. What are their needs and how do we help support them to bridge that gap to care? We're trying to build the business case for achieving health equity. MH: The CMS recently launched an interactive map that helps identify disparities and chronic conditions among Medicare beneficiaries. What was the purpose of creating this tool? James: The mapping tool, Mapping Medicare Disparities, is really the “U” part of our framework. It helps people understand disparities and their causes. In many cases, people have national data but really want to be able to drill down to figure out what's going on in their community. So we're providing the data on 18 different conditions, on prevalence rates, mortality, hospitalizations, readmissions, quality indicators, and allowing for comparisons that can help the users identify where they have particular challenges and where they may want to start trying to address issues. A lot of local organizations, some even at the state, may not have the analytic capacity to produce such results. We wanted to make it easy and user-friendly for them. MH: What role do social determinants such as poverty, crime, housing, food and security play in creating health disparities? How can government entities such as the CMS address those determinants? James: There are estimates that as much as 80% of the disparities come from those social determinants. Many communities of color have much higher rates of poverty than others and that contributes both to their inability to afford coverage, to afford housing, access healthy foods, or have neighborhoods that are safe. Recently, our Center for Medicare and Medicaid Innovation announced the launch of the Accountable Health Communities Model, which is the first model within CMS to start looking at how we help connect people to those social services to address some of those social determinants. That model focuses on transportation, housing and those sorts of things that are very important to people being able to maintain good health. MH: How does the CMS work with healthcare providers to address healthcare disparities? James: In 2013, the HHS Office of Minority Health released … culturally, linguistically and appropriate services standards to help providers understand how to address things like language, culture and the community resources that are available to provide high-quality care. We work with providers to educate them about responsibilities for providing services for people with disabilities, and also how to work with medical interpreters or others to provide services for individuals with limited English proficiency. And we also work with providers to help them connect with other community organizations that may be more trusted resources within the community. MH: Is the payment environment conducive for healthcare providers to initiate these strategies? James: The payment environment is changing. We are shifting much more to value-based medicine and value-based purchasing. There have been a lot more opportunities to test interesting models that can help promote preventive services and population health efforts. MH: Why has race remained such a large factor in determining whether an individual receives care and, ultimately, in their health outcomes? James: Race is a very complicated factor. The U.S. has a long history with race. Although the Affordable Care Act is celebrating its sixth anniversary, those problems won't go away in six years. But we are making progress. I think as you look at the disproportionate rates of uninsurance among African-Americans and Hispanics when the first open-enrollment period started, and how we have decreased the uninsured rate among those populations quite significantly, that's progress. But we still have systemic issues that we need to address. Providers, the healthcare system, have structural barriers to addressing some of those social determinants. Those aren't things that are going to be fixed overnight.